Our featured blog from April 26, 2016. We invite the community to join The Agency and our partners for our Groundbreaking event on Monday, October 17, 2016 at 10:30 a.m. at Five South College Drive, on the SUNY Broome campus at the corner of Front St. and Lt. VanWinkle Drive. 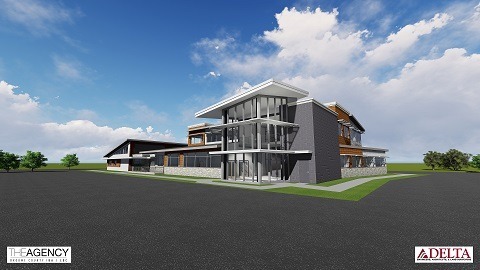 We recently announced plans to build a "one-stop" building to promote, attract, and retain economic and business opportunity in Broome County. We certainly don't take ownership of the idea, it's one that has been around for a while. The good news, as we noted in our last blog post, when knowledge, vision, and resources collide, great things can happen. And we're confident that great things will happen in our new building. We've pulled together a great team of partners to locate in the "one-stop", including the Alliance for Manufacturing & Technology, the Greater Binghamton Chamber of Commerce, the National Development Council, the New York Business Development Corporation, The Center (our small business startup incubator) and Visions Federal Credit Union. We're building partnerships with SUNY Broome Community College that go beyond just our physical proximity, with opportunities for including internships, workshops and other innovative initiatives. We have pursued this project with one goal in mind: to provide responsive and value added development services to businesses looking to expand or begin in Broome County. Navigating the complexities of financing, state programs, creating networks, and operating your business efficiently can be difficult. We plan to be a beacon of support for businesses and developers and to provide the tools to lead them to thrive. One of the many benefits of this project is the collaborative support we can create within the walls of our building. This new building presents a unique opportunity to work as partners to create prosperity. We think this proximity will create new energy and new partnerships and new ways to address the needs of the community. Of course, we have many partners to do this, and not all will be housed in our building. But it's a tremendous opportunity to showcase all that we have to offer.